Maintaining good oral hygiene may be more important than you think. Researchers have discovered significant links between bacteria that thrive in your mouth and serious health conditions, like cardiovascular disease and diabetes. How can using ProFresh® enhance my oral health? What’s the link between oral health and overall health? – People with these infections experience inflammation in the mouth, allowing bacteria (like those that cause bad breath) to enter the bloodstream and infiltrate other areas of the body. – These toxins can then cause inflammation in other parts of the body (in arteries for example) contributing to a variety of other serious health conditions. – The more severe the oral infection, the higher the risk for a range of other diseases. 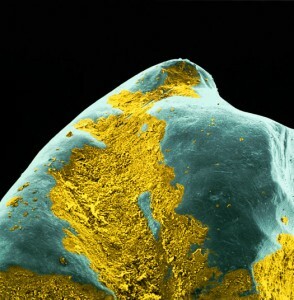 In yellow, bacterial plaque on the surface of a tooth. The acid produced as waste during bacterias’ digestive process de-mineralises the tooth creating cavities that will need fillings or may lead to tooth loss. Although levels of tooth decay have decreased over the last few decades, it is still one of the most widespread health problems in the UK. What kind of conditions can bad oral hygiene cause? Cardiovascular Disease The inflammation caused by the oral bacteria in the bloodstream, provides a base for plaque to form and build up in the arteries. This œatherosclerotic plaque increases your risk of heart attack and stroke. Endocarditis Endocarditis is an infection of the hearts inner lining. This infection occurs when bacteria from other parts of the body, like the mouth, spreads through the bloodstream. These bacteria then attach themselves to damaged tissue in the heart. Diabetes Those with diabetes are already at an increased risk for developing gum disease. Infection can cause insulin resistance, disrupting blood sugar control, making diabetes more difficult to keep-in-check. Alzheimer’s disease Research has shown that those who experience tooth-loss before the age of 35 might be at a higher risk for Alzheimer’s disease. Pre-term Birth Toxins from oral infection can interfere with a baby’s development. They can also cause mothers to produce the chemicals which trigger labour, potentially leading to premature birth. What can you do to improve your oral care, and overall health? Keeping these harmful bacteria and toxins in check is essential! The best way, is to keep your mouth as clean as possible. Normal brushing and flossing are a good start, but they can’t clear bacteria from the crevasses in the mouth where they live. The best solution is to use an anti-bacterial, therapeutic mouth rinse like ProFresh®, in order to reach every part of the mouth. ProFresh® takes a dual-level approach. It destroys, 99.9% of the oral bacteria, and prevents plaque from forming. Rinsing twice-a-day, also prevents the bacteria from coming back. The activated ingredient in Profresh® Mouth Wash, Activated Chlorine Dioxide, kills oral bacteria from the outside-in, destroying the bacteria’s cell wall first. Traditional mouthwashes that contain alcohol kill bacteria from the inside-out, and lose effectiveness before they totally penetrate bacteria cells. Using ProFresh® ensures that bacteria are completely eliminated, and rinsing twice-a-day, also prevents the bacteria from coming back. Brushing your teeth. American Dental Association. Accessed March 4, 2013. American Dental Association. Accessed Jan. 31, 2013. Dry mouth. American Dental Association. Accessed March 6, 2013. Loesche W.Dental caries and periodontitis: Contrasting two infections that have medical implications. Infectious Disease Clinics of North America. 2007;21:471. Oral health. U.S. Department of Health and Human Services. Accessed Jan. 31, 2013. Casamassimo PS. Oral and systemic health. Accessed Jan. 31, 2013. Gatz M, et al. Potentially modifiable risk factors for dementia in identical twins. Alzheimer’s & Dementia. 2006;2:110. What is endocarditis? National Heart, Lung, and Blood Institute. Accessed Jan. 31, 2013. Eating disorders. American Dental Association. Accessed Jan. 31, 2013. Sjogren’s syndrome: Questions and answers about Sjogren’s syndrome. National Institute of Arthritis and Musculoskeletal and Skin Diseases. Accessed Jan. 31, 2013.